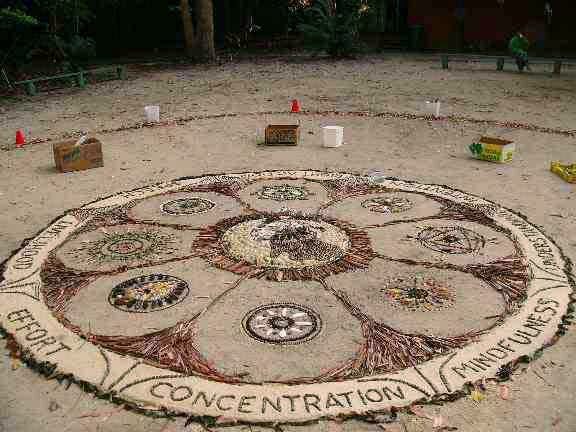 At the 2006 Dharma Gathering we constructed a large mandala near the meditation hall. We also went on beach yatra. transforming the ordinary into the sacred. treasure and debris artful companions. Love this great beautiful living earth as your true Self. May all beings find a safe harbor here. a simple joy remembers ones true nature. bleached sand, forest ash, ochre leaves and umber bark. purposefully placed in the mandala. protect this precious green planet of ours. walk with a fearless joyful heart. All things are transient this is the great teaching. Photos: Ken Golding (1,2,3,6,8), Paul Mazur (4,5,7), Poem: Subhana Barzaghi, Mandala overall design: Benny Zable, Mandala construction and detailed design: all Dharma Gathering participants.